No need to wonder if your family saw that reminder about dinner or if co-workers noticed you uploaded a PowerPoint, as Facebook Groups will soon display a count and a list of names of who saw each post. For example: “Seen by 2”, and when hovered “Josh Constine | Eric Eldon”. The feature is rolling out to English-language groups starting now. These “read receipts” is a feature Facebook recently added to Messages and Chat, and that has historically been found in some private email and SMS services. Bringing them to more public social feeds is a bold step. They’ll certainly simplify coordination in Groups and remove the need for “did you see that?” messages. But will read receipts come to the news feed? Some users might find that very creepy. First, here’s how they work in Groups. Whenever someone publishes an update, as soon as at least one person sees it a checkmark and a count of the total number of impressions will be displayed. Any user, group member, or admin with permission to see the post can then hover on the count to see a drop-down list of the names of everyone who has seen the post. You can see these counts and lists from web or mobile. 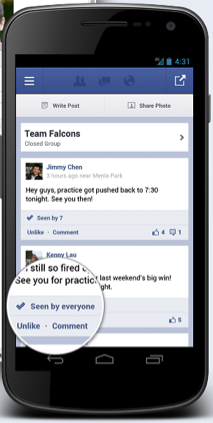 Facebook will note “Seen by everyone” in that case so you know if you’ve reached your whole squad. I see this as quite a useful feature for Groups. By referencing Reads vs Likes, you’ll get a better sense of what content resonates with your Group. It keeps everyone on the same page, and will be especially helpful for Groups designed to arrange meetups or disseminate critical information. Facebook spends a lot of time fighting spam and scam hawking “profile spy apps” that would supposedly let you see who has viewed your profile. It’s repeatedly stated that no app can do this, and I’d say it’s highly unlikely to ever show who looked at photos. I mean, people might be a lot more apprehensive to browse photos, especially of romantic interests, if they knew other people could see their activity. In the news feed, though, it could make posting seem more like a conversation where there are cues to tell if someone is listening, rather than feeling like you’re talking into a black hole. Even if people didn’t agree / Like, you’d know they had heard you. It would also show users they have a community supporting them when they post less “Likable” updates about personal hardship. Most importantly, if brought to the news feed, the feature could make people self-conscious about visiting Facebook frequently. You might look down on the friend who “reads” every one of your posts, judging them for “having no life”. In turn that could decrease feed reading by making people feel creepy for browsing. So while there are advantages, read receipts seem like they belong in Groups as a collaboration tool, not in the news feed as a sign of who’s most popular, and who’s quietly watching you.